This is blossom end rot. 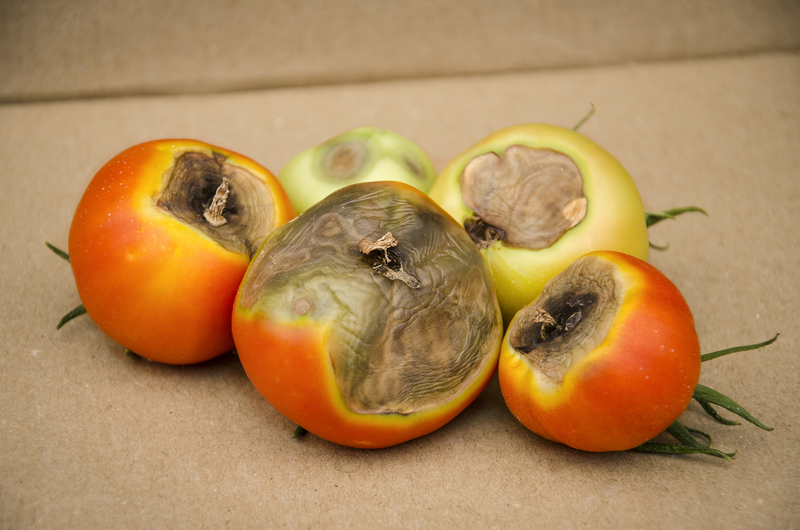 A physiological problem rather than a disease, blossom end rot occurs in fruiting vegetables as a consequence of calcium imbalance within the plant. This imbalance causes a fruit’s cell walls to weaken and eventually burst, resulting in a leathery, water-soaked area on the base. Contrary to popular belief, blossom end rot is not a result of a lack of calcium in the soil. It is actually uncommon for potting soil to have a calcium deficiency (sandy soils are a different story). Rather, this condition occurs when plants have a problem circulating calcium through the plant, from the roots to the fruits. In order for calcium to be transported properly through a plant, the plant needs to have good water flow. When a plant is stressed in its environment, it will concentrate on the leaves and the stem instead of the fruits, resulting in calcium-deprived fruits. At this point we bet you’re wondering the following: How do I treat blossom end rot if my soil isn’t (if you still have doubts we encourage you to get a soil test!) calcium deficient? The bad news is that once a fruit has blossom end rot it can’t be saved – you’ll need to chuck it in the compost bin and move on. The good news is that if you treat your plant well you can prevent more fruits on the same plant from succumbing to mushy gushy bottoms. While there is no magic product or cure that will instantly make it go away, the following tips can help you keep your tomatoes (and other fruiting veggies!) end rot free. If you see a tomato with end rot, immediately remove it. This will allow the plant to better divert calcium to the fruits that need it and haven’t been affected. Keep the soil moist and do not let it dry out. Don’t just water at the base of the stem – water all around and away from the stem as well. If it’s particularly hot outside, don’t be afraid to give your plant some extra water – but don’t give it a double-pour all at once! It is better to water twice a day than to water once with twice the volume. Be careful with fertilizers high in nitrogen! Nitrates promote leaf growth which can draw away calcium needed by the fruit. If all else fails, consider planting a different variety of tomato. Blossom end rot is more common among some varieties than others. With time and proper care the blossom end rot siege can be brought to an end. Just make sure to be patient and don’t be distraught if your first treatment route doesn’t work! Blossom end rot can sometimes be a compounding of different issues, but that only makes it all the more rewarding when you get to harvest some picture-perfect tomatoes! « Individual Stem Special Orders Now Live!